these white blocking stones are connected to the rest of the white group ( stones). It is not critical whether the circled liberties are occupied or not. For an example of a flying saucer position where the third critical element is missing, see Gokyo Shumyo, Section 1, Problem 23. 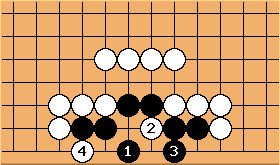 For a general treatment, see Two Space Notchers Not Fully Connected. White cuts at the other side than the one Black protects, then gives atari. She finishes off with , keeping Black at one eye. 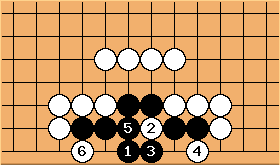 The position is symmetric, so if at 3 then at 5. 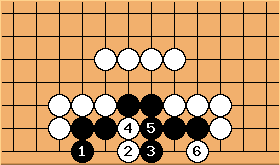 Black ends up with a 3 point big eye with already at the vital point. 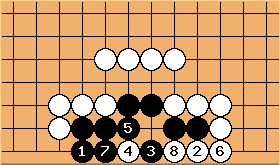 After , Black has a shape similar to six on the second row. He's dead. 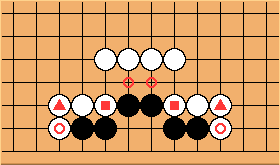 gives major resistance, but after , she can almost fill Black's eye space with three stones any time. This reverts to attempt 3.